Well, all of you people who've been clamoring for a "home tour" are going to be pleased as punch about recent developments. "Recent developments" meaning that an event occurred over the weekend that leads to you getting to see Nick and Jake's room in its "native state." We were in the kitchen and the boys were playing upstairs when we heard sort of a loud series of unidentifiable noises, then crying. Unidentifiable because we hadn't heard noises of that sort before, but not alarming because it wasn't like Boom sounds or the sounds of flesh being ripped from bone. THOSE noises, I can readily identify, you know. We trotted upstairs to find something ... MISSING ... from the wall. There used to be a curtain. And second bracket. And rod on that wall. 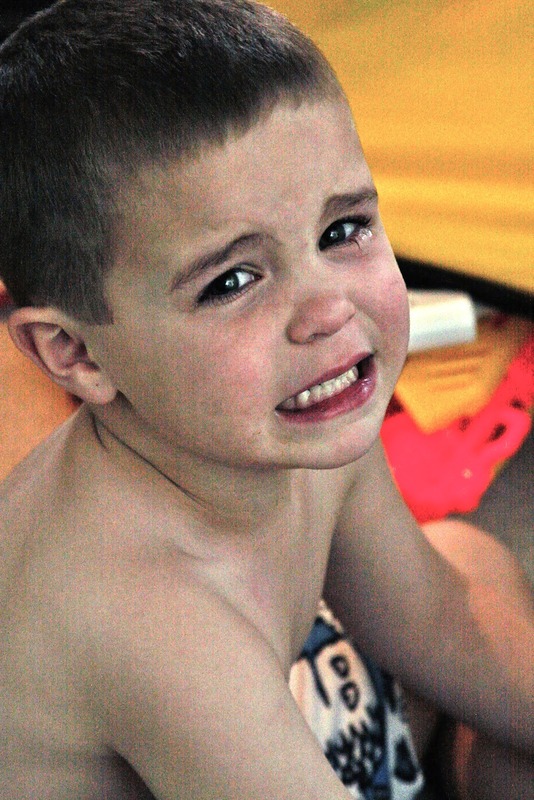 Jake was sitting in the floor crying. CULPRIT ALERT. 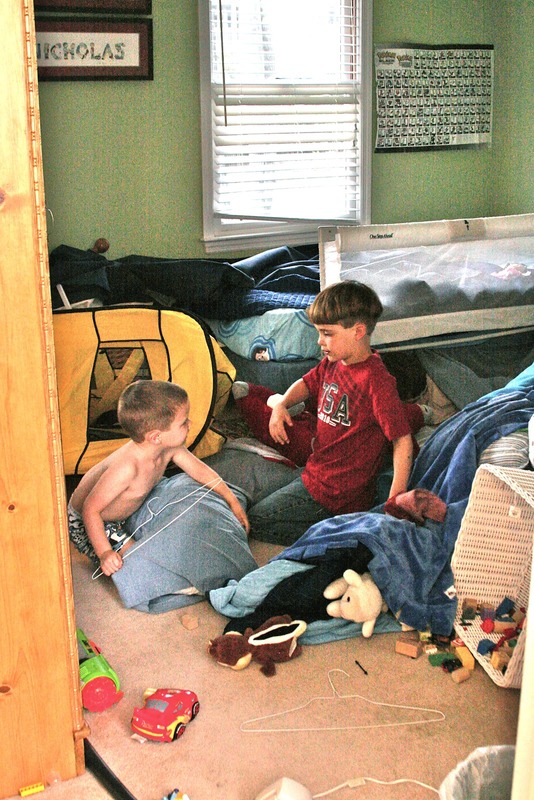 While they were playing and building forts -- innocently, of course -- somehow Jake managed to tear the rod and curtain off the wall. It then resided on the hamper. OH. Can't see it for the school bus dominating the area? Here you go. It can often be difficult to see the damage that's actually been done. You can't see the forest for the trees, so to speak. 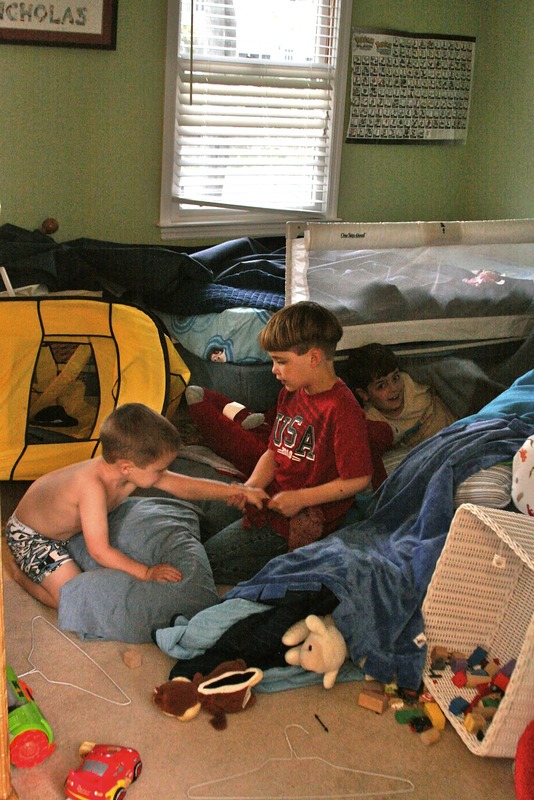 All three of them had been in there for an hour, using every blanket, sheet and quilt at their disposal, and every corner of the room that was capable of loosely holding up the coverlets, to their advantage. You and I must use the same decorator! We've gone with the Suburban Mess look in our children's rooms, too! Or at least that's the look my children have chosen! I have an 18 month old and he is the most destructive child EVER. Oh & you mean their rooms aren't supposed to look like that? My kids rooms always look like a bomb went off in the center of them. I thought it was the new "style". Have a good week friend!!! That look Nathaniel is giving the camera is priceless. Absolutely love the last picture.. Nathaniel CRACKS ME UP! I love the, "a noise we had never heard before", awesome! I first read this on my phone and had you not mentioned Nathaniel, I would not have seen him. Thank you for taking the time to grab the camera and get some good shots.